TF969 Cottage 2 persons Exclusive. Fully equipped accommodations, always in the middle of natureFree unlimited access to the subtropical swimming paradise Aqua MundoFree entertainment in tropical center the Market DomeFree (indoor) activities for everyoneEnd cleaning of your accommodationUsage of water and electricityIn the northern French Vosges, in the middle of a forest with gigantic treesHuge subtropical swimming paradise with 6 slides including the longest slide (190m) of Center ParcsZE Place, an indoor play hall for teens with exciting activities - adrenalin rush guaranteed!Thematic cottages for unexpected experiences and Exclusive cottages with a private wellness areaGo shopping or take a cultural trip to the historic cities of Nancy and StrasbourgLaser games, a free fall, an Escape Room: ZE Place is THE place for teens. Go and pet the bunnies with the little ones in the Petting Zoo and enjoy the Action Factory for hours of fun with the entire family. And explore the lake in the middle of the forest in a canoe!Enjoy our 5 restaurants under the palm trees: an endless buffet, pizza and pasta, pancakes, fiery grills and quick snacks. Are you eating in your cottage? Go to the grocery store, or have something delicious delivered!Reception and security: 24/7Information and reservation: from 9:00 till 19:00**Depending on the season Fully-equipped kitchen with: Whirlpool combined microwave oven with grill, 4 burner ceramic hob, refrigerator, dishwasher, coffee maker, kettle, toaster, Philips juice-extractor and a Dulce Gusto® coffee machine.Living room with a closed wood-burning stove and insulated flue, flatscreen LED television (42 inch) with TNT digital channels, Bluetooth Soundsystem and a rug.1 bedroom with 1 double bed, dressing table, television and a combination safe.1 spa bathroom with rainshower, double whirlpool bath , hairdryer, separate toilet and Bluetooth Soundsystem. Option booking not available Please note: the rates do not include the mandatory hirers' liability insurance. This small amount is a percentage of the rental sum starting from 10 Euros per reservation. TF963 4 p VIP Fairy Tale Kingdom cottage. Fully equipped accommodations, always in the middle of natureFree unlimited access to the subtropical swimming paradise Aqua MundoFree entertainment in tropical center the Market DomeFree (indoor) activities for everyoneEnd cleaning of your accommodationUsage of water and electricityIn the northern French Vosges, in the middle of a forest with gigantic treesHuge subtropical swimming paradise with 6 slides including the longest slide (190m) of Center ParcsZE Place, an indoor play hall for teens with exciting activities - adrenalin rush guaranteed!Thematic cottages for unexpected experiences and Exclusive cottages with a private wellness areaGo shopping or take a cultural trip to the historic cities of Nancy and StrasbourgLaser games, a free fall, an Escape Room: ZE Place is THE place for teens. Go and pet the bunnies with the little ones in the Petting Zoo and enjoy the Action Factory for hours of fun with the entire family. And explore the lake in the middle of the forest in a canoe!Enjoy our 5 restaurants under the palm trees: an endless buffet, pizza and pasta, pancakes, fiery grills and quick snacks. Are you eating in your cottage? Go to the grocery store, or have something delicious delivered!Reception and security: 24/7Information and reservation: from 9:00 till 19:00**Depending on the season Fully-equipped kitchen with: Whirlpool combined microwave oven with grill, 4 burner ceramic hob, refrigerator, dishwasher, filter coffee maker, kettle, toaster and juice-extractor.Living room with a closed wood-burning stove and insulated flue, flatscreen LED television (32 inch) with TNT digital channels.2 bedrooms: 1 bedroom with 1 double bed and 1 bedroom with bunk beds (upper bunk not suitable for children under the age of 6 years).1 bathroom with standard bath and separate toilet. Option booking not available Please note: the rates do not include the mandatory hirers' liability insurance. This small amount is a percentage of the rental sum starting from 10 Euros per reservation. TF970 Cottage 4 persons Exclusive. Fully equipped accommodations, always in the middle of natureFree unlimited access to the subtropical swimming paradise Aqua MundoFree entertainment in tropical center the Market DomeFree (indoor) activities for everyoneEnd cleaning of your accommodationUsage of water and electricityIn the northern French Vosges, in the middle of a forest with gigantic treesHuge subtropical swimming paradise with 6 slides including the longest slide (190m) of Center ParcsZE Place, an indoor play hall for teens with exciting activities - adrenalin rush guaranteed!Thematic cottages for unexpected experiences and Exclusive cottages with a private wellness areaGo shopping or take a cultural trip to the historic cities of Nancy and StrasbourgLaser games, a free fall, an Escape Room: ZE Place is THE place for teens. Go and pet the bunnies with the little ones in the Petting Zoo and enjoy the Action Factory for hours of fun with the entire family. And explore the lake in the middle of the forest in a canoe!Enjoy our 5 restaurants under the palm trees: an endless buffet, pizza and pasta, pancakes, fiery grills and quick snacks. Are you eating in your cottage? Go to the grocery store, or have something delicious delivered!Reception and security: 24/7Information and reservation: from 9:00 till 19:00**Depending on the season Fully-equipped kitchen with: Whirlpool combined microwave oven with grill, 4 burner ceramic hob, refrigerator, dishwasher, coffee maker, kettle, toaster, Philips juice-extractor and a Dulce Gusto® coffee machine.Living room with a closed wood-burning stove and insulated flue, flatscreen LED television (42 inch) with TNT digital channels, Bluetooth Soundsystem and a rug.2 bedrooms: 1 bedroom with 1 double bed and 1 bedroom with 2 single beds. Dressing table in each bedroom. Television and combination safe in the double bedroom.2 bathrooms: 1 spa bathroom with rainshower, double whirlpool bath and 1 room with shower, hairdryer, separate toilet and Bluetooth Soundsystem. Option booking not available Please note: the rates do not include the mandatory hirers' liability insurance. This small amount is a percentage of the rental sum starting from 10 Euros per reservation. 2 bedroom accommodation in Hattigny. 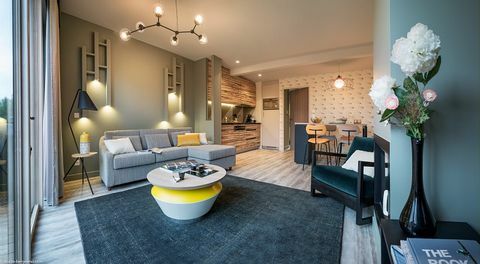 Center Parcs - Domaine des Trois Forêts - Eden Cottage Comfort 4 Rooms 6 People. What to expect: The Domaine des Trois Forest covers 435 hectares in an exceptional site where one walks there on foot, bicycle or electric golf cart. You can enjoy a unique Aqua Mundo and of immense educational farm. Mercure Metz Centre - Near Place de la Republique. Rest and nature! Small chalet at the foot of the Massif du Donon (14 km) with large garden and a path to mountain stream that flows 50 meters from your house. The perfect place for picnics. The children entertain themselves with dams. The chalet is simple but practical. It is lovely to sit on the raised terrace, you only hear the birds while enjoying a glass of Moselle wine ... The Donon is a mountain with the highest point (1,009 m) an orientation table where you have panoramic views Has a perfect walking environment with more than 700 km of landscaped trails! In Abreschviller (20 km) is a swimming lake with beach. For a larger lake with water sports facilities, visit the recreational lake at Pierre Percée (36 km). Other interesting attractions in the area include the Rocher de Dabo (40 km) with beautiful views, the Plan Incliné (ship lift) at St. Louis-Arzviller (41 km) and the nice place of St. Quirin (13 km). Baker and supermarket In St. Quiri N. For larger supermarkets and more facilities, go to Sarrebourg (29 km). 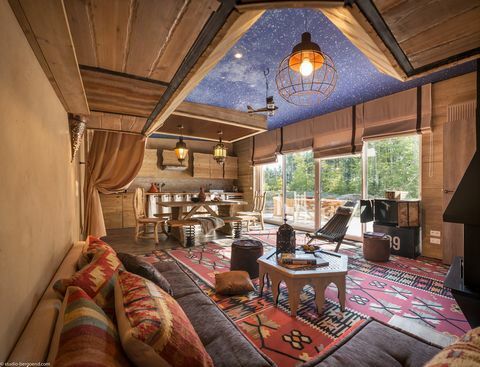 This wooden vacation home is peacefully situated on the border of the forest. The chalet was built with natural materials from the "backyard". Enjoy your patio with furniture and a barbecue. Very suitable to organize a culinary evening outside! In front of the house is a spacious lawn. Children can nicely romp around the house; there's no traffic. The decoration is simple. Still the house has everything you need. This makes it the perfect spot to be, both inside and outside! There's nature all around you! The town of Dabo is surrounded by those deep, unspoilt forests the region is so famous for. Bring your hiking shoes and backpack. An adventure for cycling enthusiasts too, or rather for mountain bikers, because of the slopes. I bet that on one of those trips you'll run into a mouflon, deer or wild boar! The owner is a forest ranger and he knows the best spots to go wildlife spotting. Visit Wangenbourg (15 km) and Nideck (24 km), with beautiful ruins and scenic views. Large swimming lake and zoo at Sarrebourg (20 km). Save a day to visit the city of Strasbourg (52 km), seat of the European Parliament and many other sights and museums. 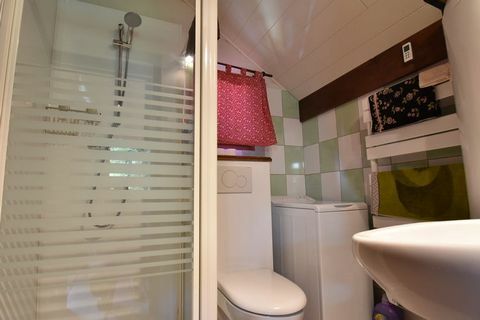 Lovely, wooden chalet with private sauna, large, decked terrace and a garden. Relax in this beautiful area in the Vosges Mountains! The baker comes to your door with fresh baguettes every morning. This small, Finnish chalet was fully renovated in 2017. It has a practical interior and it's equipped with all modern comforts. In summer, the terrace is the perfect place to read a good book and enjoy a nice BBQ. In winter, there's nothing better than to warm up in the sauna after a long walk, or to gather around the table in the cosy living room and enjoy a raclette grill meal or a fondue together. Your holiday home is situated on the road to Bitche, so it's not remote. Fancy a day out on the bicycle? There's a great cycling path that takes you from Bitche all the way to Germany, along a wonderful, car-free route. And there are some stunning walks in the woods or around the lakes of Hasselfurth (8 km) and Haspelschiedt (7 km). There's also a swimming beach at the lake. Bitche (7 km) is a nice town with several fine restaurants, shops, supermarkets and beautiful, old city walls. Regular events take place during the summer months. Interesting day trips include a visit to Zweibrucken in Germany (25 km) or Strasbourg (80 km). Please not: even though there's no WiFi, there's a good cell phone signal. Also good for 3G/4G. TF972 Cottage 8 persons Exclusive. Fully equipped accommodations, always in the middle of natureFree unlimited access to the subtropical swimming paradise Aqua MundoFree entertainment in tropical center the Market DomeFree (indoor) activities for everyoneEnd cleaning of your accommodationUsage of water and electricityIn the northern French Vosges, in the middle of a forest with gigantic treesHuge subtropical swimming paradise with 6 slides including the longest slide (190m) of Center ParcsZE Place, an indoor play hall for teens with exciting activities - adrenalin rush guaranteed!Thematic cottages for unexpected experiences and Exclusive cottages with a private wellness areaGo shopping or take a cultural trip to the historic cities of Nancy and StrasbourgLaser games, a free fall, an Escape Room: ZE Place is THE place for teens. Go and pet the bunnies with the little ones in the Petting Zoo and enjoy the Action Factory for hours of fun with the entire family. And explore the lake in the middle of the forest in a canoe!Enjoy our 5 restaurants under the palm trees: an endless buffet, pizza and pasta, pancakes, fiery grills and quick snacks. Are you eating in your cottage? Go to the grocery store, or have something delicious delivered!Reception and security: 24/7Information and reservation: from 9:00 till 19:00**Depending on the season Fully-equipped kitchen with: Whirlpool microwave oven, Whirlpool pyrolytic oven, 4 burner ceramic hob, refrigerator, dishwasher, coffee maker, kettle, toaster, Philips juice-extractor and a Dulce Gusto® coffee machine.Living room with a closed wood-burning stove and insulated flue, flatscreen LED television (42 inch) with TNT digital channels, Bluetooth Soundsystem and a rug.4 bedrooms: 2 bedrooms with 1 double bed and 2 bedrooms with 2 single beds. Dressing table in each bedroom. Television and combination safe in both the double bedrooms.3 bathrooms: 1 spa bathroom with rainshower, steam room and double whirlpool bath, 1 bathroom with sauna and rainshower, 1 bathroom with standard bath, shower, hairdryer, separate toilet and Bluetooth Soundsystem Option booking not available Please note: the rates do not include the mandatory hirers' liability insurance. This small amount is a percentage of the rental sum starting from 10 Euros per reservation. TF962 Cottage 12 persons VIP. Fully equipped accommodations, always in the middle of natureFree unlimited access to the subtropical swimming paradise Aqua MundoFree entertainment in tropical center the Market DomeFree (indoor) activities for everyoneEnd cleaning of your accommodationUsage of water and electricityIn the northern French Vosges, in the middle of a forest with gigantic treesHuge subtropical swimming paradise with 6 slides including the longest slide (190m) of Center ParcsZE Place, an indoor play hall for teens with exciting activities - adrenalin rush guaranteed!Thematic cottages for unexpected experiences and Exclusive cottages with a private wellness areaGo shopping or take a cultural trip to the historic cities of Nancy and StrasbourgLaser games, a free fall, an Escape Room: ZE Place is THE place for teens. Go and pet the bunnies with the little ones in the Petting Zoo and enjoy the Action Factory for hours of fun with the entire family. And explore the lake in the middle of the forest in a canoe!Enjoy our 5 restaurants under the palm trees: an endless buffet, pizza and pasta, pancakes, fiery grills and quick snacks. Are you eating in your cottage? Go to the grocery store, or have something delicious delivered!Reception and security: 24/7Information and reservation: from 9:00 till 19:00**Depending on the season American style kitchen fully equipped: dishwasher, combi microwave with crispfunction, ceramic hob with 5 burners, extractor hood, american fridge with icemaker, dishwasher, NESCAFÉ Dolce Gusto, coffee machine, electric kettle, toaster, single sink, work Living room with fireplace, big flatscreen-TV, DVD player, large picture windows opening onto a private terrace with garden furniture (including a parasol), carpet6 bedrooms: 2 with a double bed each, 4 with twin beds each, beds made upon arrival, dressing table in each bedroom, TV in the double bed's bedrooms6 bathrooms: 2 with whirlpool bathtub, single washbasin and toilets, 1 with a shower, single washbasin and sauna, 1 with a Turkish bath/shower cabin and single washbasin, 1 with a shower, single washbasin and toilets, 1 with a shower and single washbasin, Option booking not available Please note: the rates do not include the mandatory hirers' liability insurance. This small amount is a percentage of the rental sum starting from 10 Euros per reservation. TF966 6 p VIP Disc. woodland animals. Fully equipped accommodations, always in the middle of natureFree unlimited access to the subtropical swimming paradise Aqua MundoFree entertainment in tropical center the Market DomeFree (indoor) activities for everyoneEnd cleaning of your accommodationUsage of water and electricityIn the northern French Vosges, in the middle of a forest with gigantic treesHuge subtropical swimming paradise with 6 slides including the longest slide (190m) of Center ParcsZE Place, an indoor play hall for teens with exciting activities - adrenalin rush guaranteed!Thematic cottages for unexpected experiences and Exclusive cottages with a private wellness areaGo shopping or take a cultural trip to the historic cities of Nancy and StrasbourgLaser games, a free fall, an Escape Room: ZE Place is THE place for teens. Go and pet the bunnies with the little ones in the Petting Zoo and enjoy the Action Factory for hours of fun with the entire family. And explore the lake in the middle of the forest in a canoe!Enjoy our 5 restaurants under the palm trees: an endless buffet, pizza and pasta, pancakes, fiery grills and quick snacks. Are you eating in your cottage? Go to the grocery store, or have something delicious delivered!Reception and security: 24/7Information and reservation: from 9:00 till 19:00**Depending on the season Fully-equipped fitted kitchen with: Whirlpool combined microwave oven with grill, 4 burner ceramic hob, refrigerator, dishwasher, filter coffee machine, kettle, toaster and juice-extractor.Living room with a closed wood-burning stove and insulated flue, flatscreen LED television (32 inch) with TNT digital channels.3 bedrooms: 1 bedroom with 1 double bed, 1 bedroom with bunk beds (upper bunk not suitable for children under the age of 6 years) and 1 bedroom with 2 single beds.2 bathrooms: 1 bathroom with standard bath and 1 bathroom with shower and separate toilet. Option booking not available Please note: the rates do not include the mandatory hirers' liability insurance. This small amount is a percentage of the rental sum starting from 10 Euros per reservation. TF973 Cottage 12 persons Exclusive. Fully equipped accommodations, always in the middle of natureFree unlimited access to the subtropical swimming paradise Aqua MundoFree entertainment in tropical center the Market DomeFree (indoor) activities for everyoneEnd cleaning of your accommodationUsage of water and electricityIn the northern French Vosges, in the middle of a forest with gigantic treesHuge subtropical swimming paradise with 6 slides including the longest slide (190m) of Center ParcsZE Place, an indoor play hall for teens with exciting activities - adrenalin rush guaranteed!Thematic cottages for unexpected experiences and Exclusive cottages with a private wellness areaGo shopping or take a cultural trip to the historic cities of Nancy and StrasbourgLaser games, a free fall, an Escape Room: ZE Place is THE place for teens. Go and pet the bunnies with the little ones in the Petting Zoo and enjoy the Action Factory for hours of fun with the entire family. And explore the lake in the middle of the forest in a canoe!Enjoy our 5 restaurants under the palm trees: an endless buffet, pizza and pasta, pancakes, fiery grills and quick snacks. Are you eating in your cottage? Go to the grocery store, or have something delicious delivered!Reception and security: 24/7Information and reservation: from 9:00 till 19:00**Depending on the season Fully-equipped kitchen with: microwave oven, pyrolytic oven, 4 burner ceramic hob, refrigerator, dishwasher, coffee maker, kettle, toaster, Philips juice-extractor and a Dulce Gusto® coffee machine.Living room with a closed wood-burning stove and insulated flue, flatscreen LED television (42 inch) with TNT digital channels, Bluetooth Soundsystem and a rug.6 bedrooms: 2 bedrooms with 1 double bed and 4 bedrooms with 2 single beds. Dressing table in each bedroom. Television and combination safe in both the double bedrooms.4 bathrooms: 1 spa bathroom with rainshower, steam room and double whirlpool bath, 1 bathroom with sauna and rainshower, 1 bathroom with standard bath, 1 bathroom with shower, hairdryer, separate toilet and Bluetooth Soundsystem. Option booking not available Please note: the rates do not include the mandatory hirers' liability insurance. This small amount is a percentage of the rental sum starting from 10 Euros per reservation. TF967 Cottage 4 persons VIP Adventure. Fully equipped accommodations, always in the middle of natureFree unlimited access to the subtropical swimming paradise Aqua MundoFree entertainment in tropical center the Market DomeFree (indoor) activities for everyoneEnd cleaning of your accommodationUsage of water and electricityIn the northern French Vosges, in the middle of a forest with gigantic treesHuge subtropical swimming paradise with 6 slides including the longest slide (190m) of Center ParcsZE Place, an indoor play hall for teens with exciting activities - adrenalin rush guaranteed!Thematic cottages for unexpected experiences and Exclusive cottages with a private wellness areaGo shopping or take a cultural trip to the historic cities of Nancy and StrasbourgLaser games, a free fall, an Escape Room: ZE Place is THE place for teens. Go and pet the bunnies with the little ones in the Petting Zoo and enjoy the Action Factory for hours of fun with the entire family. And explore the lake in the middle of the forest in a canoe!Enjoy our 5 restaurants under the palm trees: an endless buffet, pizza and pasta, pancakes, fiery grills and quick snacks. Are you eating in your cottage? Go to the grocery store, or have something delicious delivered!Reception and security: 24/7Information and reservation: from 9:00 till 19:00**Depending on the season Fully-equipped fitted kitchen with: Whirlpool combined microwave oven with grill, 4 burner ceramic hob, refrigerator, dishwasher, filter coffee machine, kettle, toaster and juice-extractor.Living room with a closed wood-burning stove and insulated flue, flatscreen LED television (32 inch) with TNT digital channels.2 bedrooms : 1 parental bedroom " Amazonian " with canopy bed 180x210, 1 kids bedroom "Flamingos" with mezzanine bed 90x210 (superior bed is not allowed for kids under 6 years) and a single sofa-bed.1 bathroom with standard bath and separate toilet. Option booking not available Please note: the rates do not include the mandatory hirers' liability insurance. This small amount is a percentage of the rental sum starting from 10 Euros per reservation. TF951 Cottage 8 persons Comfort. Fully equipped accommodations, always in the middle of natureFree unlimited access to the subtropical swimming paradise Aqua MundoFree entertainment in tropical center the Market DomeFree (indoor) activities for everyoneEnd cleaning of your accommodationUsage of water and electricityIn the northern French Vosges, in the middle of a forest with gigantic treesHuge subtropical swimming paradise with 6 slides including the longest slide (190m) of Center ParcsZE Place, an indoor play hall for teens with exciting activities - adrenalin rush guaranteed!Thematic cottages for unexpected experiences and Exclusive cottages with a private wellness areaGo shopping or take a cultural trip to the historic cities of Nancy and StrasbourgLaser games, a free fall, an Escape Room: ZE Place is THE place for teens. Go and pet the bunnies with the little ones in the Petting Zoo and enjoy the Action Factory for hours of fun with the entire family. And explore the lake in the middle of the forest in a canoe!Enjoy our 5 restaurants under the palm trees: an endless buffet, pizza and pasta, pancakes, fiery grills and quick snacks. Are you eating in your cottage? Go to the grocery store, or have something delicious delivered!Reception and security: 24/7Information and reservation: from 9:00 till 19:00**Depending on the season American style kitchen fully equipped: dishwasher, combi microwave with crispfunction, ceramic hob with 4 burners, extractor hood, refrigerator, dishwasher, filter coffee machine, electric kettle, toaster, single sink, work surface made in reconstituted sLiving room with fireplace, flatscreen-TV, large picture windows opening onto a private terrace with garden furniture (including a parasol)4 bedrooms: 2 with a double bed, 2 with twin beds, dressing table in the double bed's bedroom2 bathrooms with a tub/shower and single washbasin, separate toilets Option booking not available Please note: the rates do not include the mandatory hirers' liability insurance. This small amount is a percentage of the rental sum starting from 10 Euros per reservation. TF955 Cottage 10 persons VIP. Fully equipped accommodations, always in the middle of natureFree unlimited access to the subtropical swimming paradise Aqua MundoFree entertainment in tropical center the Market DomeFree (indoor) activities for everyoneEnd cleaning of your accommodationUsage of water and electricityIn the northern French Vosges, in the middle of a forest with gigantic treesHuge subtropical swimming paradise with 6 slides including the longest slide (190m) of Center ParcsZE Place, an indoor play hall for teens with exciting activities - adrenalin rush guaranteed!Thematic cottages for unexpected experiences and Exclusive cottages with a private wellness areaGo shopping or take a cultural trip to the historic cities of Nancy and StrasbourgLaser games, a free fall, an Escape Room: ZE Place is THE place for teens. Go and pet the bunnies with the little ones in the Petting Zoo and enjoy the Action Factory for hours of fun with the entire family. And explore the lake in the middle of the forest in a canoe!Enjoy our 5 restaurants under the palm trees: an endless buffet, pizza and pasta, pancakes, fiery grills and quick snacks. Are you eating in your cottage? Go to the grocery store, or have something delicious delivered!Reception and security: 24/7Information and reservation: from 9:00 till 19:00**Depending on the season American style kitchen fully equipped: dishwasher, combi microwave with crispfunction, ceramic hob with 5 burners, extractor hood, refrigerator, dishwasher, NESCAFÉ Dolce Gusto, coffee machine, electric kettle, toaster, single sink, work surface made in rLiving room with fireplace, big flatscreen-TV, DVD player, large picture windows opening onto a private terrace with garden furniture (including a parasol), carpet5 bedrooms: 2 with a double bed each, 3 with twin beds each, beds made at arrival, dressing table in each bedroom, TV the double bed's bedrooms6 bathrooms: 2 with whirlpool bathtub, single washbasin and toilets, 1 with a shower, single washbasin and sauna, 1 with a turkish bath/shower cabin and single washbasin, 1 with a shower, single washbasin and toilets, 1 with a shower and single washbasin, Option booking not available Please note: the rates do not include the mandatory hirers' liability insurance. This small amount is a percentage of the rental sum starting from 10 Euros per reservation. From the main road you take the country road, where the valley at the foot of picturesque Bitche (4 km) literally opens its gates for you. Welcome in this oasis of greenery, tranquillity, space and most of all in this deer paradise (private)! As soon as you enter the gate, 50 hectares of enclosed grounds are literally at your feet during your stay. As you drive further over the country road, toward the holiday home, you'll certainly meet some of the owners' deer. Once arrived in front of the house, you'll drive through another gate where this detached, completely renovated holiday home opens its doors for you, with its beautifully landscaped and enclosed garden (separate from the deer) with large terrace, colourful flowers, shrubs and a pond with fish (not protected). This is truly a unique spot and holiday home. The house is spacious and very bright, fully equipped and you can look out over the valley with deer, who are literally on the same level, directly from the living/dining room. Your garden (within the 50 hectares) is fully enclosed, so you literally have a garden in the centre of an enclosed animal/nature park. Now this is truly unique! 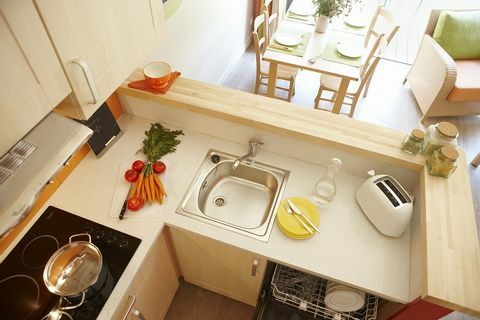 The house consists also of a spacious kitchen, 2 bedrooms and a loft; it's suitable for 4 to 6 people. The owners have invested a lot in quality furniture and the house features very good beds and mattresses. From the house you can take a beautiful walk through the woods to the idyllic town of Bitche, known for its 17th century citadel. In Bitche you can also get all your daily groceries; you'll also find good restaurants here and even a 27-hole golf course with a view of the city walls and the city. During the summer, various events are organised. This is also a great area for cycling. Nearby, there's a cycling path that runs from Bitche all the way to Germany (car-free). A visit to the lakes of Hasselfurth (7 km) and Haspelschiedt (12 km) is also worth it. Here you'll also find a swimming beach. A day trip to Zweibrucken (in Germany, 23 km), also known for its large outlet shopping centre or the pleasant city of Strasbourg (81) are also recommended. A wonderful place to get back to at the end of the day; light the BBQ and enjoy the beautiful wild animals around you. Your private safari from your house! Tip! We recommend wildlife enthusiasts to also come and stay here during the autumn. Besides the beautiful colours of the trees, it's also mating season for the deer. If you're looking for a spacious, unique, warm and modern luxury chalet in the heart of the green Moselle region, this is the perfect place! This fantastic chalet is located in Saint-Quirin. It was built by the friendly owners and finished in the summer of 2018. You'll find everything you may need for a great holiday here. You can already tell from the exterior that this is a special place, but wait until you step inside! Not to mention the wonderful veranda with lounge set overlooking the large, nicely landscaped, enclosed garden. Plenty of privacy! The owner of the house is very creative and has her own glass studio adjacent to the house. You'll recognise her great taste for decorating throughout the house. 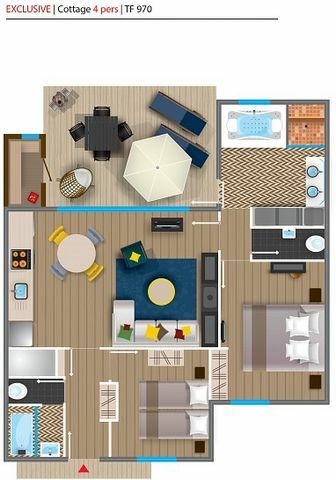 Your holiday home features a bright, modern and nicely furnished living room. There's a well-equipped open kitchen with bar. The living/dining room and kitchen both offer views of the veranda and the sunny garden. There's also a spacious bathroom with double washbasins, a separate toilet and two spacious bedrooms, furnished with high-quality beds and mattresses. The perfect place to unwind! Saint-Quirin is on old pilgrimage village with around 900 inhabitants. It's set in the green hills of the Vosges mountains, at the foot of Col du Donon. A beautiful area for walking and cycling. And you won't have to go far for the typical Christmas atmosphere in winter. The beautiful 'route des vins' is only a 1.5-hour drive away and it takes you along many authentic villages hosting traditional Christmas markets. In fact, this tour around the Vosges mountains is worthwhile any time of year. Strasbourg is around 80km away and also worth a day trip. The Saint-Louis-Arzviller inclined plane is 25km away, on the Marne-Rhine Canal. It enables the canal to cross the Vosges mountains. Tip! Don't forget to take a look around the owner's studio Verre-Luisant. She sells a range of lovely, handmade souvenirs and she can also arrange a workshop upon request. Want to go to France, enjoy nature, culture and history, but you don't want to drive too far? That's possible during your holiday in this wonderful and comfortable home in Niderviller (Moselle, Lotharingen). The house has recently been renovated and is fully equipped. You will feel right at home. The house enjoys an ideal location in a quiet, green neighbourhood. 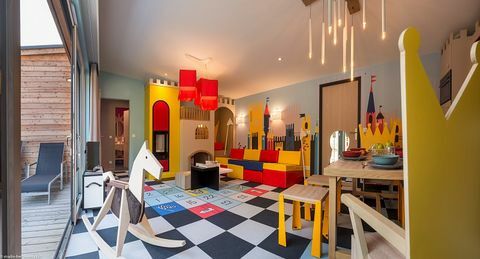 Ideal for children! There's a spacious balcony around the house, leading to the spacious enclosed garden (in the front and back of the house). Got your groceries from the centre already and are you done working out in the fitness room downstairs? Then it's time for a well-deserved aperitif in the sun. Sit down with a baguette and some cheese; the barbecue is lit, the others are playing football in the garden, so you can finally enjoy your book. Your day couldn't get any better. The pleasant centre of Niderviller is within walking distance (1 km). Here you'll find a few nice restaurants and bistros and you can get your groceries here as well. In Sarrebourg (5 km) you can find museums, larger shops and a beautiful golf course. The region is known for its pottery and porcelain from as early as the 18th century. You can't escape that! You can also quickly get to the Alsace and the Vosges. What about a day to Strasbourg (70 km), the famous wine route or a day to the mountains? After a wonderful holiday you can go shopping on the way home in the outlet of Metz or Zweibrücken. It's fantastic! This semi-detached gite lies in peaceful surroundings, in the centre of the village. Good standard, attractively furnished accommodation. Enclosed garden with garden furniture and a barbeque. This (wheelchair suitable) holiday home is located at the top of the village of Varsberg and has a beautiful view of the surroundings. This house consists of 2 very neat holiday houses, each with its own entrance and the owner lives upstairs. 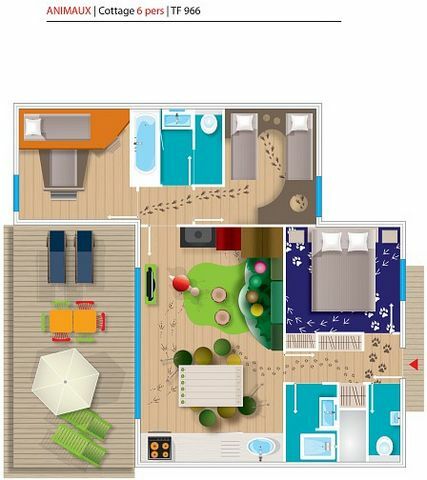 If you go with 8 to 12 people and still like to go on holiday together, you can even rent both holiday homes at the same time! 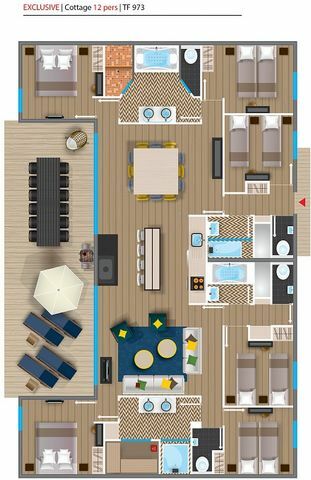 The holiday homes are identical, but have a mirrored layout. There are 2 neat and spacious bedrooms and a double sofa bed in the living room. The bathroom is tight and wheelchair friendly. From the living room you have direct access to your terrace with BBQ and from the garden you can walk into the woods. The owners have horses, so for lovers it is possible to make a horse ride! The village Varsberg is a nice village with colored houses characteristic of the Moselle region. From your cottage it is a few minutes walk to the bakery for fresh croissants and baguettes. Within a 5-minute drive you can reach Lake Creutzwald which lies between the woods. Here you can walk around the lake, picnic, cycle, fish and there is a water sports center. Welcome to holiday home la Verrerie in Saint-Quirin, on the glass and crystal route, the land of Sarrebourg, where nature, culture and history meet and where you can stay in a unique holiday home with hot tub! This specially decorated loft combines an industrial and modern character with warmth, colour and cosiness. The furnishings have been very carefully created, making this house so very unique. The house has 2 spacious, tastefully furnished bedrooms with a large double bed each and a smaller children's bedroom with an adult single bed. The friendly owner is an artist and has a workshop at the other side of the building. However, thanks to the unique setting, stunning, green, private garden with wonderful hot tub and various sunny and shady terraces, you'll be able to enjoy plenty of privacy. There's something for everyone! The holiday home enjoys a very favourable location. Just a 400 m walk and you're in the centre with several shops (baker, butcher, small supermarket) and restaurant. A larger supermarket, swimming pool and golf course can be found in Sarrebourg (17 km), a nice town by the way! For a day of water fun you can visit the recreation lake, just 300 m away, the swimming lake with beach in Abreschviller (6 km) or the large Lac de Pierre Percée (31 km), with several beaches and canoe and peddle bike rental. There also is a nice steam train in Abreschviller, offering a train ride through the woods. You can go on endless hikes from the house, but a panoramic view of the area can be found on top of the de Col du Donon (22 km). Other interesting sights in the area are the Rocher de Dabo (30 km) with a beautiful view and the Plan Incliné (ship lift) at St. Louis-Arzviller (25 km). 3 bedroom accommodation in Hattigny.